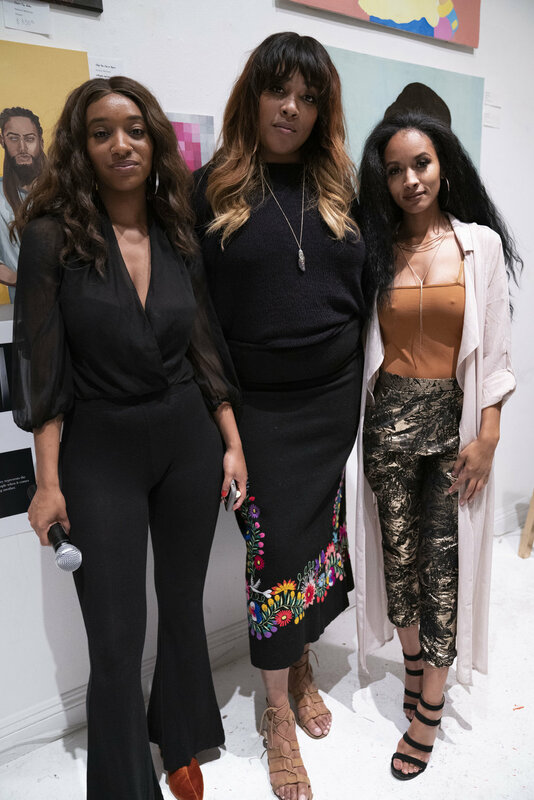 Pick It Up LA’s 1 Year Anniversary Art Show: More Than A Woman was a HUGE success! The best outcome to date, I mean, it was literally like a movie. This show brought together 16 beautiful souls to display unique styles of artwork at Innerspace Gallery in Los Angeles. The sense of community created among these women lit a fire in me I didn’t know I needed. Shoutout to Saidah Gray, my lifelong friend and business partner, for bringing all of us together with a vision. The entire experience was one I’ll never forget. All the sleepless nights, anxiety, last minute stresses… 100% worth it. And the best part about it is it’s only up from here. “La Huesera” The Bone Woman. 24” x 24” Oil on canvas. My exhibit featured, in my humble opinion, some of the most beautiful work I’ve ever done… all (apart from one) produced this year. I have a different kind of love for these pieces because they came from a different place inside me—a healed place, more self-actualized… I’ll dive deeper in another blog post. Short and sweet… it reflects a different way in which I’m relating to the world around me and relating to myself. It’s liberating and I can see ways I’ve grown as an artist and as a person. I’m so ready for this next chapter. I’m talkin’ house packed! The capacity of the venue was about 200 & we sold it out! 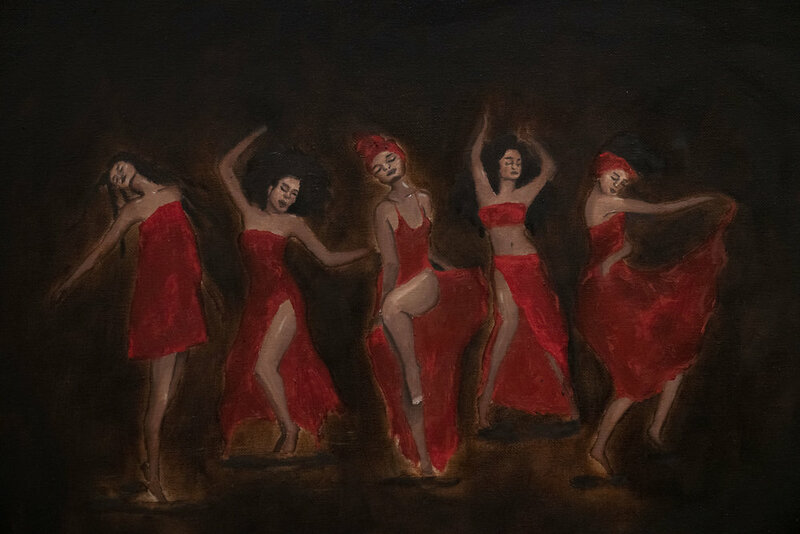 All of the smiling faces, good vibes, dancing, mingling, new connections and artful conversations… just had my spirit dancing. A few times I had to take a step back to observe the crowd just to take in the amazing feeling of witnessing our guests actually enjoying themselves. The support was unreal. It was a night to remember. The best thing about Pick It Up LA group art exhibitions is the community first approach that creates a space for participating artists and poets to really connect and create a sense of communal support. Participating in one of our shows means building a real network among like-minded creatives and making real connections. This experience is one I’ll never forget & it’s largely due to all the amazing talent involved. A group shot before the show. Not to mention our dope media team: Charles, Curtis and Dillon. Great people we were so blessed to work with who are responsible for most of the photo/video footage you’ll be seeing. And everyone else who makes an event like this so special… from those working the bar, checking people in, etc… all coming together like family. I am so happy to be part of this team, a partner in Pick It Up LA working alongside Saidah, the creator of the event and Shion Love, an amazing, inspiring, dope poet and partner as well. Our energies are aligning to a greater vision and we have sooo many plans we will execute together in divine timing. I can’t wait to share with you. All the support means the world! Me doing a decent job pretending I don’t hate public speaking. Shoutout to all the ladies who participated in the show! I’m lucky to have met you and shared wall space with you: Alexis, Moofasa, Saloni, Amanda, Yoli, Tempest, Lawren, Saidah, Sumaya, Valencia, Chelsie, Jennifer and Brittney. And the dope poets of the evening: Shion, Ryan and Saloni. Shoutout to everyone who came through, the greatest gift is your presence. Thank you! Here are some other photos I got with some of the guests at the show! 2017 Amber Ledet. All rights reserved.